In a recent year, more than 35,000 non-fatal workplace injuries and illnesses were reported among Alabama's private industry employees. Being hurt on the job can create a host of problems, including loss of wages and mounting medical bills. If you are hurt on the job, it is important that you know your rights under the Alabama Workers' Compensation laws. Contact the Alabama workers' compensation attorneys at Hollis, Wright, Clay & Vail, P.C. so that you are not taken advantage of by your employer or the workers' compensation insurance company. Workers' compensation insurance, which provides partial wage replacement and medical benefits to employees injured on the job, is a type of insurance that almost any Alabama employer with five or more employees is required by law to have in place. There are only a few exceptions to this five-or-more-employee rule. Alabama's Workers' Compensation laws provide benefits to both employees and employers. The primary benefit to an employee is that he or she is guaranteed certain monetary and medical benefits upon sustaining an on-the-job injury or occupational disease. Additionally, the workers' compensation area of the law in Alabama is a no-fault system, which means that the employee does not have to prove that someone else engaged in misconduct to cause the injury. Likewise, with only a few exceptions, even if the employee did something wrong to cause his or her injury, the employee is still entitled to be compensated under the law. An employer cannot use the employee's own misconduct against them. Finally, the injured employee is entitled to receive medical benefits for his or her entire life for treatment related to the on-the-job injury. Medical benefits for life is unique to Alabama, as most states cap the medical benefits for an on-the-job injury to a certain number of years. What are the employer rights? The monetary benefits that an employee receives for an on-the-job injury often don't reflect the significant nature of the injury sustained by the employee. The Alabama workers' compensation statute divides into schedule and unscheduled injuries. Scheduled, or "member," injuries typically involve injuries to eyes, hands, fingers, legs and arms. Unscheduled injuries, also known as "whole body" injuries usually involve spinal injuries, head injuries, brain injuries, hip injuries, shoulder injuries and nerve damage. The employer enjoys monetary caps as to the amount an injured employee receives, as well as the length of time the injured employee receives the benefits. The employer has some control over the doctor that an employee is allowed to see for the injury. An employee is bound for the initial visit after the injury to see a doctor authorized by the employer. Employees who seek advice from a doctor of their choosing run the risk of losing medical benefits. Should the employee be dissatisfied with the physician the employer chooses for the initial visit, there is an avenue whereby the injured employee can select another one. Most often, attorneys handling workers' compensation cases are familiar with treating physicians in the area and can help in selecting the new provider. This is another reason it is wise for an injured employee to immediately hire an attorney. What steps should you take if you're injured on the job? The incident and injury should be reported to your employer as soon as possible so that your employer knows exactly what work-related activity you were performing at the time of the injury. The employee should report the injury within five days of the accident, with a delay of 90 days could result in a loss of coverage. Alabama law states that the employer selects the doctor for the employee's initial treatment in a non-emergency situation. Seeking medical advice as soon as possible will ensure a proper diagnosis, as well as a record of injuries. Reporting even what is perceived as a minor injury is of the utmost importance. Even seemingly minor injuries can turn into more serious situations. What types of workers' compensation benefits should I expect? Temporary Total Disability Benefits: After an on-the-job injury, employees are entitled to two-thirds of their average weekly wages during their time out of work. Once an employee's medical condition improves, he or she will be determined to be at Maximum Medical Improvement (MMI) and will return to work. Permanent Partial Disability Benefits (PPD) or Permanent Total Disability Benefits (PTD): If the injury or condition is permanent in nature, or otherwise prevents the employee from returning to work, the employee is entitled to additional monetary benefits. By law, both temporary and partial disability benefits are capped. Employee Death: Should the employee die in an on-the-job incident, then death benefits and burial expenses are likely owed to the family of the deceased. The extent to which surviving family members are entitled to workers' compensation death benefits hinges upon whether the deceased worker had any dependent family members at the time of death. 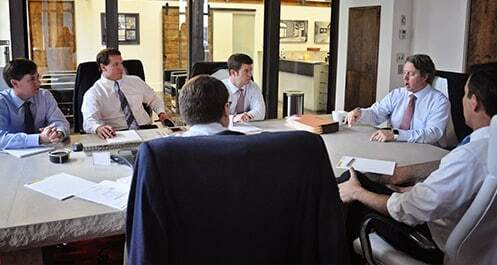 Why hire the Alabama workers' compensation attorneys at Hollis Wright? The workers compensation laws in Alabama are complex, meaning any misstep by the employee could result in a termination of benefits. The Alabama workers' compensation attorneys at Hollis Wright have years of experience representing injured workers. Our attorneys are extremely well versed in Alabama workers' compensation laws, as well as the intricacies of workers' compensation insurance. Our Alabama workers' compensation attorneys will fight for you to receive the maximum amount to which you are legally entitled. You may contact us here for a FREE consultation or call us at 844.LAW.TALK or 205.324.3600. All workers' compensation cases are handled pursuant to a contingency-fee agreement, which means we don't get paid unless we successfully recover money for you.